2 Days Left For The "Review a Social DApp" Contest!!!! This is a short post informing everyone about the contest we launched a few days ago in association with State of the Dapps. Still 2 days left to submit your entries. All participants are eligible to get upvotes whether they win or not. Upvote value based on our discretion. 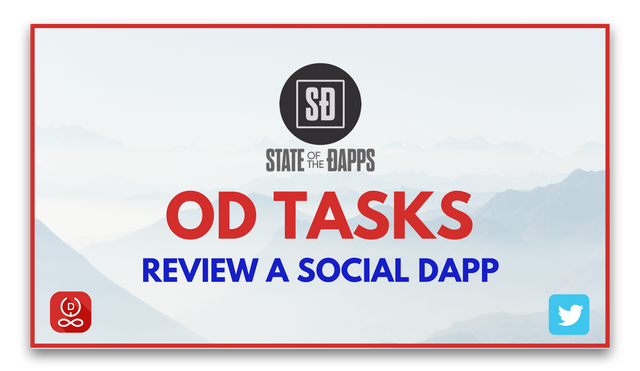 For detailed guidelines and information, please check this blog: Review a Social DApp & Earn Rewards ft. State Of The DApps! Submit all your entries on this post by @oracle-d.tasks. Social Networking websites are quite famous and they help human civilization to get connected with each other and interact on a whole new level. Adding the Blockchain spices to it can create a great impact on the time spent by the users since they are incentivized in some or the other way. Create content, share messages, earn tokens and transact real money are some of the common features of these DApps that set them apart from traditional social media. This contest is a great opportunity to review some of the amazing projects out there in this particular category. Posted them all in your Task # 3 with all the links to Twitter and Medium also. I am already participate this contest. Will finish it ASAP, thanks for reminding. i am already post a blog about Dapp.. I have already presented my Dapps review post and voted @oracle-d as witness. Now I am making preparation for spreading awareness about utopian colony through making a post.yesterday or next day I will post related your project "Support Utopian's Indiegogo Campaign and Earn Rewards!! Thank you for your awesome contribution. This article translated @Oracle-D 2 Days Left For The "Review a Social DApp" Contest!!!! into Japanese. I arranged a little. Oh @oracle-d. I thought it is over. That was why I didn't participated again. Thanks for this update. I'm already on it again. Hello @oracle-d, your application form has been closed for over a month now, there are lots of steemians looking to join this wonderful community. I in particular would love to play my own role in what you are building here on the steem blockchain.